In Fandom Unbound, Mizuko Ito explores how the once marginalized popular culture of otaku has come to play a major role in Japan’s identity at home and abroad. Casey Brienzapraises the book for encouraging a new generation of otaku into the academy to pursue further groundbreaking research in this new field. Fandom Unbound: Otaku Culture in a Connected World. Edited by Mizuko Ito, Daisuke Okabe, and Izumi Tsuji. Yale University Press. March 2012. “Otaku culture,” writes cultural anthropologist Mizuko Ito in the introduction to Fandom Unbound: Otaku Culture in a Connected World, “defies simple definition. 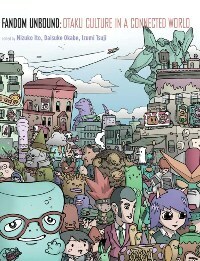 Emerging first in Japan in the 1980s as a marginalized and stigmatized geek subculture, it has gradually expanded its sphere of influence to become a major international force, propelled by arguably the most wired fandom on the planet.” In this edited volume, Ito and her colleagues Daisuke Okabe and Izumi Tsuji set out to map this international force through the transnational circulation of anime, manga, and videogames. In the process, they shed new light on the sometimes secretive creative habits and practices of active and passionate otaku consumers in Japan and the United States. Fandom Unbound’s twelve chapters, written by a total of ten authors based in either America or Japan, are divided equally into three sections of four chapters each on ‘Culture and Discourse,’ ‘Infrastructure and Place,’ and ‘Community and Identity.’ The first section is the most theoretical, its chapters focusing on who, precisely, the otaku are and how they came to be. The second section is devoted to how otaku have transformed – or may potentially transform—the geographic, digital, and legal spaces in which they have become embedded. And the final section provides a series of case studies on particular otaku subcultures, those of the fujoshi, cosplayers, fighting gamers, and AMV creators, respectively. Unfortunately, this anthology’s dynamic ethnographic storytelling is not coupled with overarching theoretical narrative of equal force. Kitada’s chapter on the Japanese social media platform 2ch and its relationship to mainstream media critique, along with an excerpt from a previously published English translation of Azuma’s Otaku: Japan’s Database Animals, together comprise a deeply critical, problematizing core to the study of otaku culture which is simply not replicated elsewhere in the anthology. Otherwise, Henry Jenkins is the most cited scholar, a choice that leads more to celebration than ideological critique. Sure, this is a book about media consumption—but where are the culture industries that made all this media in the first place? Ito et al. would have been well-advised to consider more carefully the ways in which media power is complicit in, and benefiting from, the development of fandom. Prough’s book Straight from the Heart on shoujo manga publishing in Japan or even my own ongoing research on manga publishing in the United States would have been useful in this context.The great strength of Fandom Unbound is its thick description of otaku cultures. Ito et al. have assembled a fantastic, international team of contributors, and in the tradition of the very best ethnographers, they bring vibrantly alive people utterly unknown to most of the world. Better still, otaku will recognize themselves in these pages, even as they derive new perspectives on their own fan practices from the book’s penetrating theoretical and sociological analyses. In particular, Tsuji’s chapter on train otaku, Eng’s on American anime otaku culture, and Ito’s on anime music video (AMV) subculture are excellent. And Morikawa is to be likewise applauded for his convincing chapter on the Tokyo neighbourhood of Akihabara’s transformation into an otaku mecca. All in all, this is an important, albeit flawed, book. With its smart, careful organization, skilled Japanese-to-English translation, and grounded, lucid argumentation, it makes a clear contribution to the still much under-investigated phenomenon of East to West cultural flow that is certain to be much read and cited in the future. In fact, it is likely to encourage a new generation of otaku, who might otherwise have not considered themselves or their cultures legitimate subjects of serious scholarship, into the academy to pursue further groundbreaking research in this new field. I look forward to that. Recommended for students and scholars of fan studies and Japanese popular culture. Casey Brienza is a PhD candidate in Sociology at the University of Cambridge and member of Trinity College, Cambridge. She received her AB from Mount Holyoke College in 2003 and her MA from New York University’s Department of Media, Culture, and Communication in 2009. Her doctoral thesis, fully funded by an External Research Studentship from her College, is being written under the supervision of John Thompson on manga publishing and the transnational production of print culture. Casey also has refereed articles in print or forthcoming in journals such as The Journal of Popular Culture, Publishing Research Quarterly, Journal of Graphic Novels and Comics, and The International Journal of the Book. She may be reached through her website. Read more reviews by Casey.